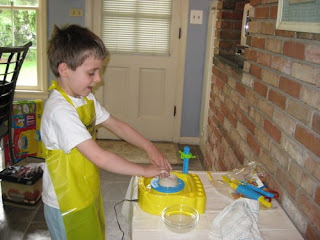 In the past few weeks we've been focusing our homeschool themes on skilled crafts and it's been a blast because it encompasses so much great knowledge. While covering ceramics we learned about the science of what clay actually is, the history of pottery, the various tools & skills involved in producing ceramics, ceramics in our daily life & art, etc. Who knew it could cover so much ground? We also did some field trips to a paint-your-own pottery place & our local treasure Greenfield Village to see an actual pottery workshop in action. Ethan was riveted by how the spinning potter's wheel would produce such amazing things from lumps of clay within seconds so I was kind of bummed there weren't any places that offered classes in throwing for young children. 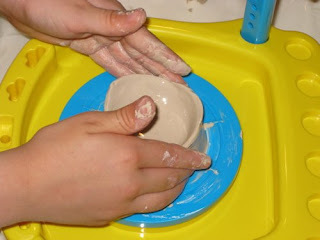 That is, until I found this while on holiday this weekend: Creativity For Kids Pottery Studio. This kit is beyond cool. 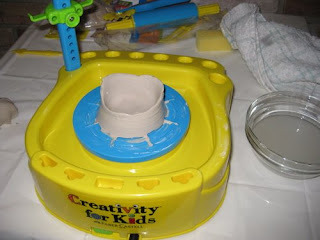 It has a functioning kid-sized potter's wheel with foot pedal, 3 lbs of air dry clay, tools, non-toxic glazes, paintbrushes, very simple and educational manual - even a tarp & apron to make clean-up easy. It was super simple to set up and is just the right size for little hands. It says ages 8+, but my 6 yr old caught on immediately and my 3 yr old will enjoy just modeling with the clay and the painting after it dries. I had a lot of fun trying it out too. Within 24hrs pieces are ready to paint so it's really like having your own pottery studio available at home. It also doesn't take up much space or dent your pocketbook (our recent paint-your-own visit was just to paint pre-made pieces and was over half the cost of this kit which can be used over & over!). Two big thumbs up on this being something that is educational, affordable & provides a lot of constructive activity. Who knows, we may have a sculptor-in-the-making in our house!